Also know as erotomania, De Clérambault’s syndrome is one in which a delusional belief is held by a patient that another person, usually older and of higher social status, famous, wealthy or in a professional relationship with the patient is deeply in love with them. Pursuing the object of their affections and repeatedly pestering them by telephone, by letter and with gifts is typical. Some people suffering from this disorder arrange ‘holidays’ or ‘weddings’ with their supposed lover. Preoccupations with supposed love form a central part of the subject’s existence. Repeated attempts to approach the supposed lover creating at least embarrassment and distress. The condition is rare and has various aetiologies; it can surface in association with schizophrenia or affective disorders, or on its own as a single delusional disorder. It is seen in forensic populations as a result of criminal acts secondary to the delusion and is one of a number of behaviours that may be associated with stalking. 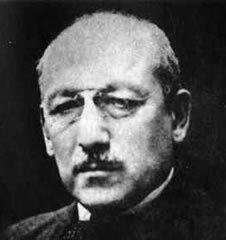 The disorder is named after French psychiatrist Gaëtan Gatian de Clérambault (1872–1934), who published a review paper on the subject (Les Psychoses Passionelles) in 1921. The syndrome has featured in popular works, perhaps the best well know of which is Ian McEwan’s Enduring Love. It is thought to have effected John Hinckley, Jr. who shot President Regan in 1981 in an attempt to impress actress Jodie Foster, who he believed wanted a sign of his devotion. This entry was posted on Wednesday, December 2nd, 2009 at 10:42 am	and is filed under Psychiatric Eponyms, Specific psychiatric disorders. You can follow any responses to this entry through the RSS 2.0 feed. You can leave a response, or trackback from your own site.